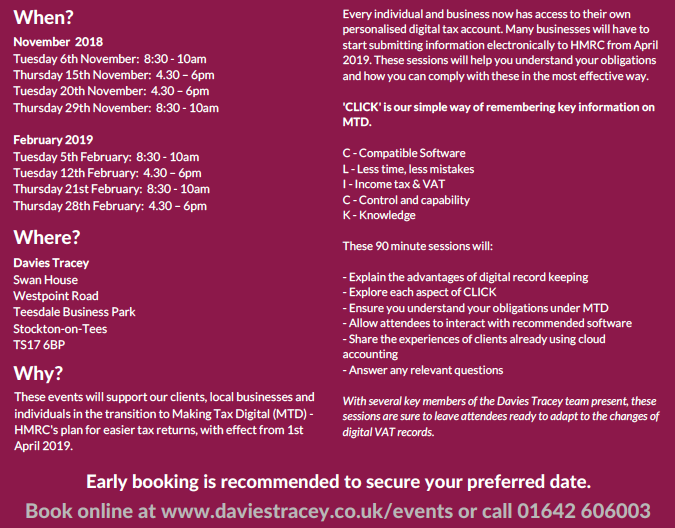 Tees Valley based accountancy practice Davies Tracey have responded the region’s uncertainty about HMRC’s plan for easier tax returns by hosting several bite-sized events this November. ‘Making Tax Digital’ (or #MTD if you’re a twitter user) will take effect from 1st April 2019, having been planned and piloted by HMRC since 2015. Despite this long test period, recent research by the Institute of Chartered Accountants in England and Wales shows that over 40% of businesses that will be affected are not yet aware of Making Tax Digital. In addition, research shared by HMRC shows that, whilst a modern digital tax system is broadly welcomed, individuals and businesses still need clearer communications and reassurance on their new responsibilities, account security and privacy, and available support if encountering difficulties. 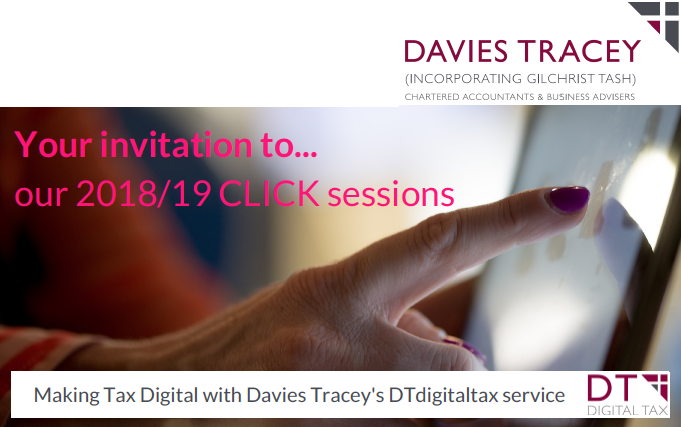 This research matches concerns voiced by Davies Tracey’s own clients, and in response they have launched DT Digital Tax – a website full of tips and advice about cloud accounting. Not only this, but they have also developed their own memorable Making Tax Digital mnemonic – CLICK (you can find out what each letter of CLICK represents at www.dtdigitaltax.co.uk), and will hold CLICK sessions over the coming months to help both clients and non-clients understand their obligations and how to comply with Making Tax Digital in the most effective way. The free, 90 minute events will run on set days between 6th November 2018 to 28th February 2019, at Swan House in Teesdale Business Park, Stockton. Further information and online booking can be found at www.daviestracey.co.uk/events (or call 01642 606003). Early booking is recommended to secure your preferred date. Please contact Jayne.lee@daviestracey.co.uk for further information.